Innovating the business processes of an enterprise requires their preliminary analysis and assessment. In particular, information on the performance and costs of activities and processes must be gathered in order to identify candidates for innovation. A critical point is finding suitable presentation means of the gathered data in order to support effectively the decision makers. This paper presents a strategy and supporting tools for business process innovation. The strategy integrates measurement, decision making, and critiquing techniques, for analyzing business processes, identifying activities and software systems that are candidate to innovation, and mapping critiques onto specific innovation actions. The strategy is supported by a toolkit, named WebEv+, that integrates the WebEv environment, for managing the assessment and evaluation tasks, and ArgoUML, for modeling and critiquing business processes. 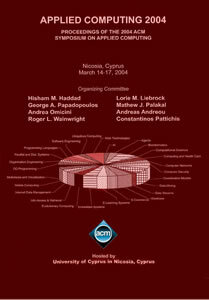 The 19 th Annual ACM Symposium on Applied Computing (SAC 2004) hosted by the University of Cyprus in Nicosia. The Symposium is sponsored by the ACM Special Interest Group on Applied Computing (SIGAPP) whose mission is to further the interests of computing professionals engaged in the development of new computing applications, interdisciplinary applications areas, and applied research. SAC is devoted to the study of real-world problem applications using a variety of computational algorithms. It provides an avenue for discussion and exchange of new ideas, associated computational algorithms, and interesting complex applications. This goal is reflected in the spectrum of application areas and tutorials designed to provide a wide range of topics.Welcome to the 19th Symposium on Applied Computing (SAC 2004). Over the past 18 years, SAC has been an international forum for researchers and practitioners to present their findings and research results in the areas of computer applications and technology. The SAC 2004 Technical Program offers a wide range of tracks covering major areas of computer applications. Highly qualified referees with strong expertise and special interest in their respective research areas carefully reviewed the submitted papers. As part of the Technical Program, this year the Tutorial Program offers 6 half-day tutorials that were carefully selected form numerous proposals.SAC's open call for Track Proposals resulted in the submission of 31 track proposals. These proposals were carefully evaluated by the conference Program Chairs. Some proposals were rejected on the grounds of either not being appropriate for the areas that SAC covers traditionally or being of rather narrow and specialized nature. Some others were merged to form a single track, on the grounds of having substantial overlap with each other. Eventually, 26 tracks were established, which then went on to produce their own call for papers. In response to these calls, 787 papers were submitted, from which 280 papers were strongly recommended by the referees for acceptance and inclusion in the Conference Proceedings. This gives SAC 2004 an acceptance rate of 36% across all tracks. Furthermore, it makes SAC 2004 the most successful conference in the history of SAC so far, but also one of the most popular and competitive conferences in the international field of applied computing.